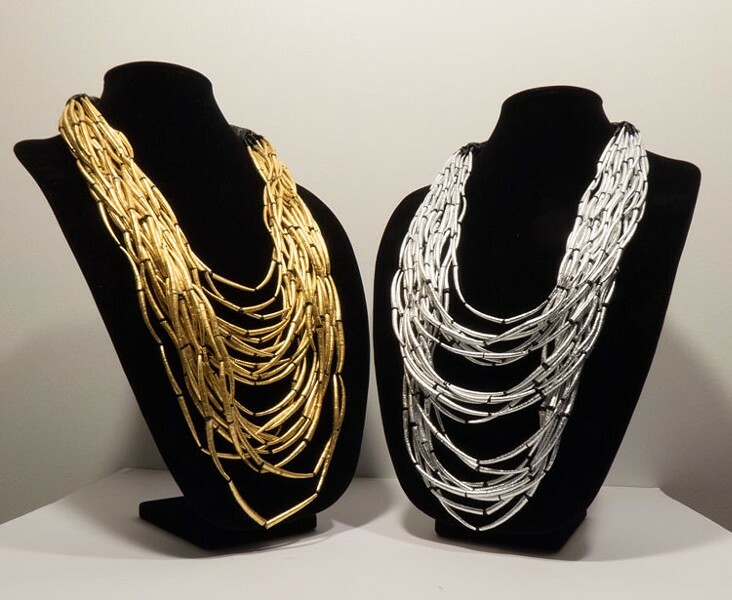 Courtesy of the artist Brittany Britton's "A Measure of Something" adds gold and silver to traditional dentalia necklaces. 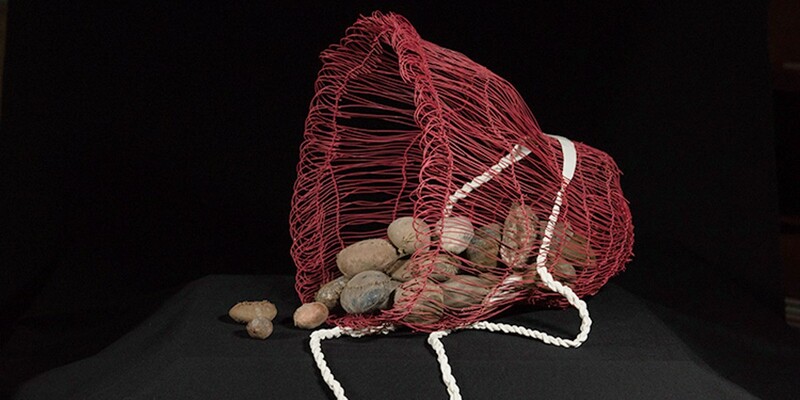 Courtesy of the artist Brittany Britton's "Burden Basket (carry that weight)," filled with wrapped river stones. Photo by Sue Natzler One of Brian Tripp's sculptures showing at Piante Gallery. Courtesy of the artist Bob Benson's watercolor "Fall River Fishing Place." What They Bring, What They Carry brings together artworks by Brian Tripp, Brittany Britton and Robert Benson — artists of Karuk, Hupa and Tsnungwe descent, respectively, who grew up in and around reservations in the Hoopa and Two Rivers regions. 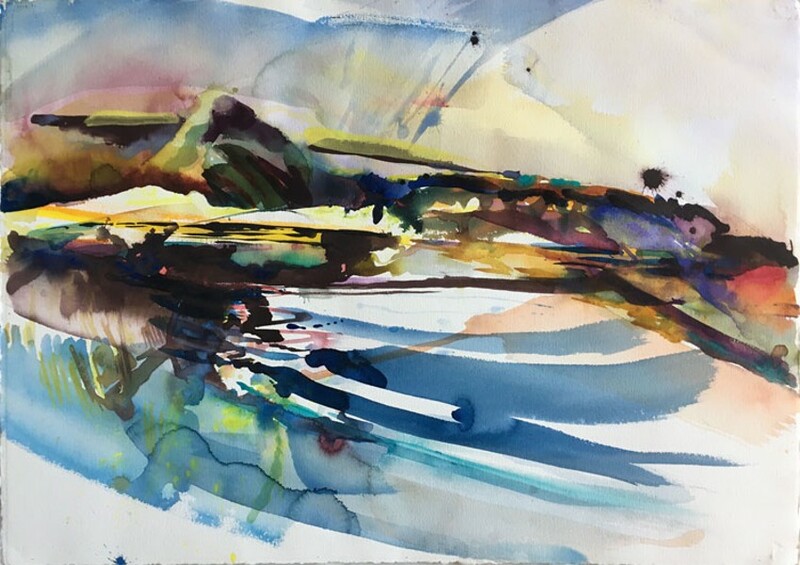 Tripp and Benson, who have exhibited regionally and nationally for decades, use process to articulate connection to place. Britton, showing at Piante for the first time, makes art that is more conceptually driven. All three work with indigenous forms. Benson grew up in Willow Creek. Britton was raised on the Hoopa reservation in a "dance family" that took part in traditional ceremonies. Tripp's family came from near Somes Bar in the Two Rivers region but he grew up in Eureka. All three studied art at Humboldt State University — Tripp and Benson in the 1970s, Britton in the 2000s — and spent time out of state before returning to their native land. 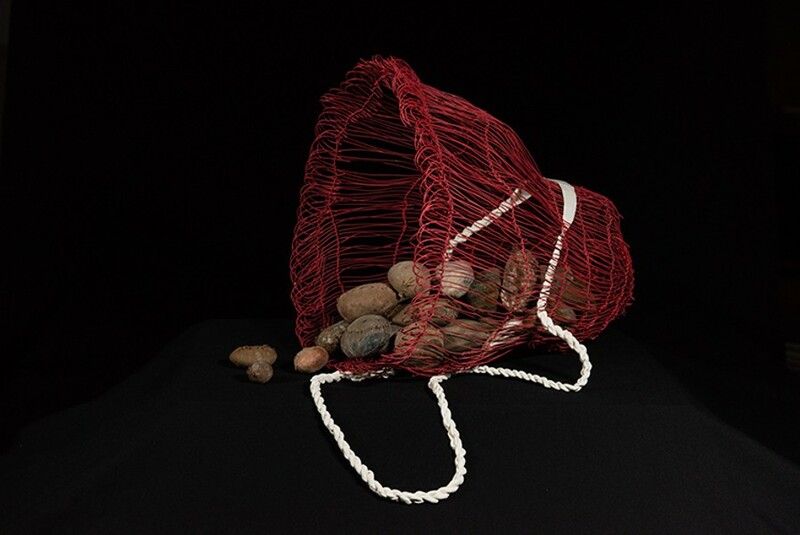 The exhibition title carries both a literal and a symbolic charge, like many objects in the show, notably a Britton piece titled "Burden Basket (carry that weight)." The open weave net basket is laden with amorphous bundles mounted on a long stick for ease in carrying. The weave is traditional; the wire is glossed with red flexi-spray utility dip. Britton made the piece while she was living in Portland, Oregon, pursuing her MFA at the Oregon School of Arts and Craft. She drew on weaving skills learned from local native traditions and further developed at OSAC. She also relied on a timely assist from her mother and grandmother, who live near the Trinity River. "I called and asked them to send me a box of river rocks in the mail," she recalls, laughing. "I said, 'Fill up a flat rate package with rocks from the river bar.' They didn't even ask any questions, just said: 'How many?'" Once the rocks arrived, Britton swaddled them with pantyhose. Veiled this way, the stony forms look substantial and yet obscure. To see the way these burdens cluster in the bottom of the basket is to get a sense of the mass that belies their gauzy surfaces. Britton often works this way, taking objects that possess significance in traditional culture, executing them in new materials and positioning them in novel contexts. Materials are fungible. Tropes turn into memes. "Beaded Lawn Chair" reproduces the familiar form of an affordable mass-produced outdoor furniture model made from aluminum tubing and nylon webbing. It's important to know that this is not just any lawn chair but a replica of the one Britton's great-grandmother, a Hupa medicine woman, brought with her to ceremonial dances. Britton has covered every inch of the chair's surface in beading, embellishing and estranging its mass-produced form. The surface treatment recalls bedazzling, even as it nods to the persistence of indigenous pattern. "A Measure of Something" consists of two multi-strand necklaces made of dentalia shells, which the Hupa once used as currency. These shells have been covered with gold and silver leaf. The forms are weighted with traditional significance but the flashy surface treatment makes them of the now. The piece's title is the English translation of the Hupa word for money. "A lot of my titles are derived this way — they're English translations of Hupa words," Britton said. Because the languages are so different, "those translations sometimes possess this intensely poetic dimension." The Hupa, she says, thought of money as an extension of the principle of measurement. Monetary value for them was not the prime directive it has become in advanced capitalism. The necklaces are not meant to repose in a vitrine, and only one of them is for sale. Britton wears them in gender-bending drag performances that she describes as negotiations of identity: "Me grappling with 'How do I articulate what it is to be Native, and what it is to be Native and queer?'" She calls the gold necklace, with its traditional form and blingy aspect, "an awkward catalyst. I wanted to take this traditional form, make it gold and over-the-top. Maybe queer it, in a way. In the objects I was making, I was imagining possibilities of being. What does a queer indigenous culture look like? Because we don't know." In Britton's work, the political is always personal and vice versa. 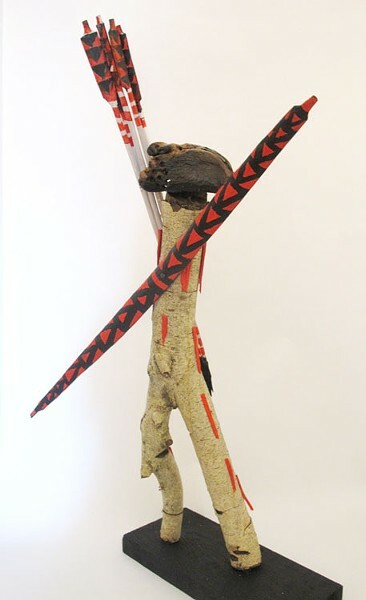 In the anthropomorphic sculptures Karuk artist and poet Tripp has been making from found natural forms since the 1970s, the political is made manifest through nature's forms. "I spend a lot of time on the river bars, where the rocks and the driftwood lay in piles," he says. "I see faces and I see arms — sometimes they pop right out." Sometimes he touches the faces up with brilliant patches of red, black and blue. "Most of the time, I leave it pretty natural." Tripp describes the sculptures he is showing as being made from minimally manipulated, found pieces of wood. Some of the faces he finds turn up in chunks of driftwood that wash up on the Klamath River bar. Others are made from madrone and manzanita ("wood that hasn't been in the river yet"). "You know what they say about Indians — that we're close to nature," Tripp chuckles. "And it's true. In our religion we believe there's life in everything. That's what our religion is based on — recognition of ikxaréeyav, the spirits that live in everything." Like Shakespeare's Prospero in The Tempest, who can perceive "tongues in trees, books in the running brooks, sermons in stones, and good in everything," Tripp sees the faces that shape themselves for the attentive viewer in the wood as ballast for this principle. "I have a stack of these sculptures I'm looking at right now. And they're looking back at me. We've all been programmed to ignore these things when we see them," Tripp suggests. "But they're there for anyone to see, if they pay attention." "If you look at these things I've done," the artist continues, "they're so natural, there's no denying them. You see what nature's done in these things. And if you think about nature this way, if you realize that it has a spirit all its own — if you look at nature as something to live with — when it comes to scooping gravel out of the river bank, you might think about that differently." It's politics and geography converged. Don't miss the watercolors by Robert Benson, "Now is the Time to Go Up the Mountain" and "Fall River Fishing Place." Benson began as a painter but sculpture has consumed most of his energies in recent years — which makes the unexpected appearance of these luminous, process-oriented works on paper all the more welcome. What They Bring, What They Carry will be up at Piante Gallery at 620 Second St. in Eureka from Nov. 4 through Dec. 16. Call 441-1322 or visit www.piantegallery.com.